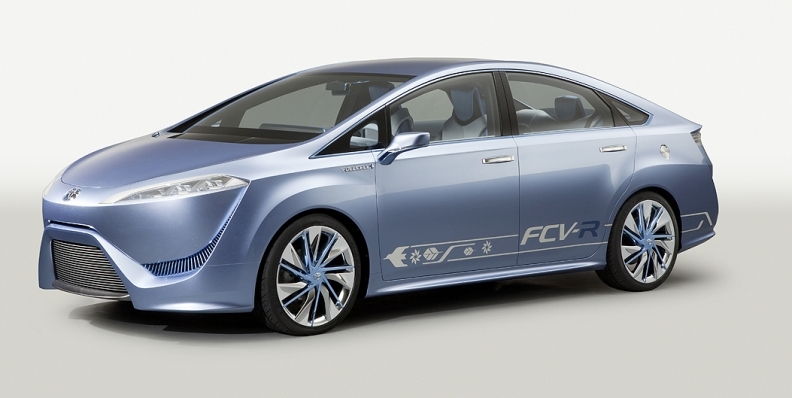 The FCV-R hints at a hydrogen-powered fuel cell sedan that Toyota plans to start selling in 2015. WASHINGTON -- Remarks by two aides to President Barack Obama this week calling fuel cells part of the solution for improving automobile efficiency gave boosters some optimism the United States will help create a market for the technology. Hydrogen fuel cells, encouraged by President George W. Bush, lost favor to plug-in electric vehicles after Obama took office in 2009. Energy Secretary Steven Chu questioned the merits of hydrogen-powered cars and cut funding for fuel-cell research, as Obama set a goal of having 1 million electric vehicles on the road by 2015. "There's been a dramatic turnaround in the past six to nine months of the need for this in the future" by the Energy Department, Scott Samuelsen, National Fuel Cell Research Center director, said in an interview at a conference in Washington sponsored by the Hydrogen Education Foundation. "What has not yet occurred is the action that will be needed to meet the needs by 2015." That's the year by which automakers including Toyota Motor Corp. are aiming to introduce their first fuel-cell vehicles in the United States. Honda Motor Co.'s FCX Clarity and Daimler AG's Mercedes Benz B-Class are available now in parts of California, where environmental rules encourage zero-emission vehicles. Revived interest in fuel cells coincides with congressional scrutiny of U.S. financial assistance to plug-in vehicle and battery makers including A123 Systems Inc. and Fisker Automotive Inc.
Last year, Congress held hearings into a fire in a General Motors Co. Chevrolet Volt after crash testing. Automotive fuel cells are layers of platinum-coated plastic film sandwiched between metal plates that create electricity from the chemical reaction of hydrogen and oxygen. Vehicles use the same type of electric motors and controls as battery-only models, and neither emits tailpipe pollutants. Hydrogen, the universe's most abundant element, is available in high volume for industrial uses by reforming natural gas or splitting water using electricity. Heather Zichal, Obama's top aide on energy and climate change, called hydrogen cells "an opportunity" for improving fuel economy in remarks at Tuesday's conference. She urged the United States not to fall behind Japan, Germany and Korea in research and production. She cited FedEx Corp., Wal- Mart Stores Inc. and Wegmans Food Markets Inc. for using fuel cells to power vehicles for their fleets. "Fuel cells are truly an integral part of our portfolio and part of our all-in approach," David Danielson, Energy Department assistant secretary for energy efficiency and renewable energy, said at the conference. On Thursday, Mercedes will open a fuel-cell factory in Burnaby, Canada, that the automaker calls the world's first dedicated to producing the devices solely for passenger vehicles. The company has said the 2,000-square-meter line will make fuel cells for use in Mercedes' C- and E-class sedans. Auto executives at the conference said they aren't looking for loans or grants like they sought for plug-in electric cars because the technology is developed, though they'd welcome U.S. support for hydrogen fueling stations and a nice word from Chu. Toyota is "trying to figure out what the next few years are going to be like and how we can get the number of stations we need to support our rollout," said Craig Scott, advanced technologies group manager for Toyota Motor Sales USA. "Otherwise we have a lot of very expensive lawn ornaments." U.S. drivers have only 56 hydrogen fueling stations to choose from, according to the Energy Department. Twenty-three of those are in California. Installing a hydrogen fueling station costs from $500,000 to $800,000, said Samuelsen, whose center is located at the University of California at Irvine. Neither Danielson nor Zichal, speaking at the conference, made promises of helping build fueling stations for consumers. Senator Ron Wyden, an Oregon Democrat who has sponsored legislation to give tax incentives to buy hydrogen-powered cars and to install fuel pumps for them, said the administration hasn't come far enough. "Research and development funding for fuel cells keeps getting cut, and it has year after year," Wyden said at the conference. "Fuel-cell technology is not something that is fodder for debates for decades in the future." Obama's budget request would cut funding for the Energy Department's Hydrogen and Fuel Cell Technologies office to $80 million in the 2013 fiscal year from $103.6 million in this year's budget, said Bill Gibbons, a department spokesman. GM announced plans in 2006 to build 100 hydrogen-powered sport-utility vehicles in 2007 and to have 1,000 fuel-cell vehicles on the road by 2010. The Detroit-based automaker built more than 100 hydrogen- powered Chevrolet Equinoxes, some of which are still used in fleets, said Randal Fox, a GM spokesman. Lack of fueling infrastructure has limited GM's investment and production, Fox said. "Fuel cells can be commercialized by mid-decade in limited quantities, in specific geographic regions where refueling infrastructures exist," he said. "GM continues to develop the technology in an effort to reduce costs and continues to assist in the deployment of an infrastructure for mass production." Fuel cell vehicles, estimated to cost more than $1 million each a decade ago, can eventually be mass-produced at much lower costs than battery-only models, Michael O'Brien, Hyundai Motor's U.S. vice president of product development, said in an interview in La Jolla, California, yesterday. Unlike battery-electric cars such as Toyota's Scion iQ EV, Ford Motor Co.'s electric Focus hatchback and Honda's Fit EV, fuel-cell vehicles tend to be midsize-class sedans and SUVs. They have a range of 300 miles (483 kilometers) or more per fill-up and can be refueled in about five minutes, making them more comparable to gasoline-engine cars than plug-in electrics, O'Brien said. Honda rents the FCX Clarity in 3-year leases to 25 customers for about $600 per month. The company expects to have more cars available to lease next month following production disruptions caused by last year's earthquake in Japan, Jonathan Otto, a Honda spokesman, said. Mercedes, which has invested $2 billion in fuel-cell vehicle research, leases 44 fuel-cell vehicles, said Sascha Simon, Mercedes-Benz USA advanced product planning director. Simon said in an interview last month that Mercedes's first hydrogen cars for sale to retail customers will sell for "much less" than $50,000. "There is not that chicken-and-egg issue of what comes first, the car or the station," he said yesterday. "Both have to happen at the same time. You can't have one without the other."